A dislocation is is an injury to a joint in which the ends of the bones are forced from their normal positions. The shoulder is a "ball-and-socket" joint where the "ball" is the rounded top of the arm bone (humerus) and the "socket" is the cup (glenoid) of the shoulder blade. A layer of cartilage called the labrum cushions and deepens the socket. A shoulder dislocation occurs when the humerus pops out of its socket, either partially or completely. As the body's most mobile joint, able to move in many directions, the shoulder is most vulnerable to dislocation. 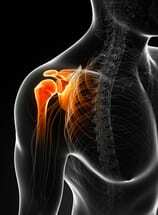 A shoulder dislocation may be caused by a sports injury, trauma from a motor vehicle accident or a fall.